Not so long ago, the personalities of the market’s dominant smartphones were clearly drawn: The iPhone, fun and full of flash, was for consumer uses, while Research in Motion’s BlackBerry, sober and spartan, dominated the professional market. But the line between work and play has grown blurry, leaving the iPhone—and a new competitor, Google’s Android—to challenge Research In Motion (RIM)’s long dominance in businesses and among professionals. During its July quarterly earnings call, Apple claimed that more than 80 percent of Fortune 100 companies use the iPhone. That’s a big increase from the 50 percent the company cited in its October 2009 report. Chris Jones, the principal analyst for Canalys’, a high-tech industry research firm in Palo Alto, California, estimates the iPhone now carries 14 percent of the business market, compared to RIM’s 48 percent. “RIM’s share would’ve been two-thirds or three-quarters of the market a year or two ago,” Jones said. More companies are using the iPhone to sell their products; they’re also more likely to distribute the device to their workforces for internal productivity uses. And in many cases, analysts say, the change has come from bottom-up, with Apple devotees smuggling their iPhones into the workplace and forcing company IT departments to adapt. 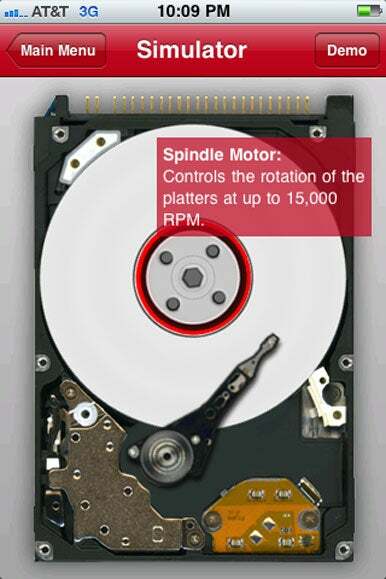 DriverSavers, a data recovery firm, created an iPhone app so technicians called to a site could show customers what happened to their broken hard drives. Educating customers Why did my hard drive fail? That’s what customers wanted to know. DriveSavers, a data recovery firm based in Novato, Calfornia, created a “hard drive simulator” iPhone app so customers could see what happened. “[The iPhone app] helps our resellers explain to customers why the data recovery process might take as long as it will—or, if they’ve suffered a catastrophic data loss, why their data cannot be recovered,” said Lynda Martel, marketing director for DriveSavers. Social media at the ready Lindye Galloway, a wedding and event coordinator in Newport Beach, California, uses her iPhone—and her iPad—to manage nearly every aspect of her business, even tracking money and finances with the consumer-level Mint.com app. But the phone—which accompanies Galloway as she shuttles between events and appointments—is particularly handy when it comes to making contacts and promoting her business through social media apps like Facebook and Twitter. For example, he uses the Tripit planner to track the travel itineraries of his employees. “Before, that was something maintained manually by an administrative assistant,” Goble said. Now, the iPhone app does all the work. SKM Group Production Manager Chuck Malczewski gets an advertisement approval by comparing PDF proofs on his iPhone. Instant feedback anywhere SKM Group, an advertising agency based outside Buffalo, N.Y., uses the iPhone 4 to speed up its creative processes. 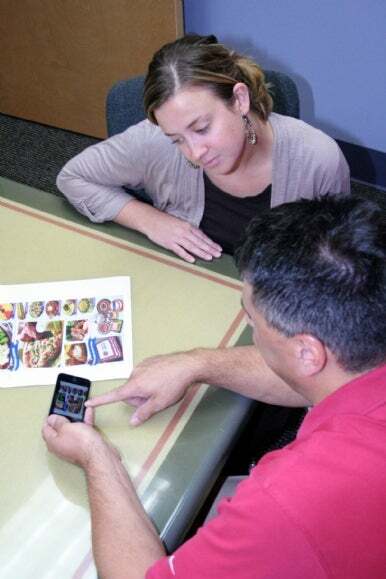 Employees use the FaceTime video chat app for staff conferences and to provide instant feedback on artistic concepts. The phone’s high-resolution camera and Retina display make transmitting and receiving visual changes to designs crystal clear. “We did it the same way before—through e-mails and rerouting PDF’s—but an iPhone makes [process] faster and disconnects a staff member from being tied down to their desk,” said Charlie Riley, interactive services manager for the firm. There’s no doubt that the wide variety of iPhone apps has contributed to businesses’ creative adoption of Apple’s smartphone. Back at Quintessa Winery in California, Jim Harris can reel off a long list of apps that help his employees be more productive: Dragon Dictation, Skype, and GoodReader for iPhone among them. His staff even uses the iPhone camera’s geotagging function to document the status and progression of the winery’s grape crops. But the iPhone’s “cool” factor is still the major selling point for Harris, because it means the device will get used. “The likelihood of an employee actually having this and looking at it and engaging it is very likely with an iPhone,” Harris said. Joel Mathis is a freelance writer and political columnist for Scripps Howard News Service. He lives in Philadelphia.